Created in New Zealand by professional tradesmen, our Jade Treasures bring quality jade products to the world. We welcome you to our website and invite you to browse through our extensive range of high quality jade products. Hand crafted from pure New Zealand jade, these items provide you with the opportunity to purchase life long gifts and artefacts. Our shop is ideally situated in Cable Car Lane, off Lambton Quay in central Wellington, directly opposite the entrance to Wellington’s iconic cable car. Take the time to come up the short stairs and enter our shop. Here you will find our large selection of quality, hand crafted products. In addition, come in and talk to us about all your jewelry repairs. We do re-threading, re-lashing, re-shaping your jewelry and now use new adjustable slip-knotted cords. 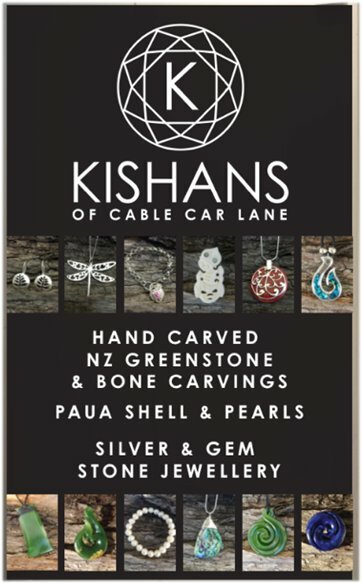 Contact Kishans of Cable Car Lane to have your special piece designed and hand crafted in your choice of precious metal set with your favourite gemstone. We also do an opal cutting and carving service and we make to your design, repair / replacement of your opal jewelry.